PRODUCT AVAILABLE IN USA ONLY. The TMA10A is ideal for HVAC/R technicians measuring Heat/Ventilation/ Air conditioning/Refrigeration wind flow and temperature in residential, commercial and industrial air conditioning systems. It offers numerous functionsuse it to check air velocity FPM (Feet per minute), air volume (flow) CFM (Cubic feet per minute) plus the remote vane allows greater measurement location flexibility. Switch between C and F. Input the area of airflow measurement to gain accurate air velocity results. Measure an air flow source for a continuous moving average for up to two hours. Determine minimum, maximum and average readings from a single point air source. Large dual display to view both air flow or velocity measurement plus temperature. Long extended flexible cord for remote vane access capabilities. All the TMA10A measurements can be output to a computer for charting or analysis by optional model TM-SWA software and RS232 cable. 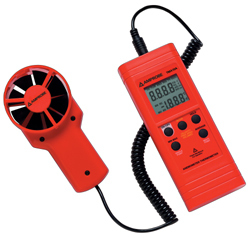 Shipped in a deluxe hard carry case to protect and transport your Anemometer. 203 TruReward$ points will be placed in your account when you buy this item.